In a stunning reversal of fortune for newspapers, some of the biggest retailers in the nation have taken to selling advertising and featuring editorial content at their busy and heavily promoted online shopping sites. 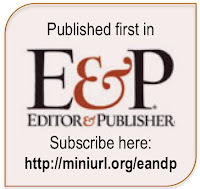 By transforming themselves into publishers, the folks who formerly depended on newspapers to reach prospective customers are building direct, powerful and sustainable connections with consumers in a strategy that is bound to reduce demand for traditional advertising. 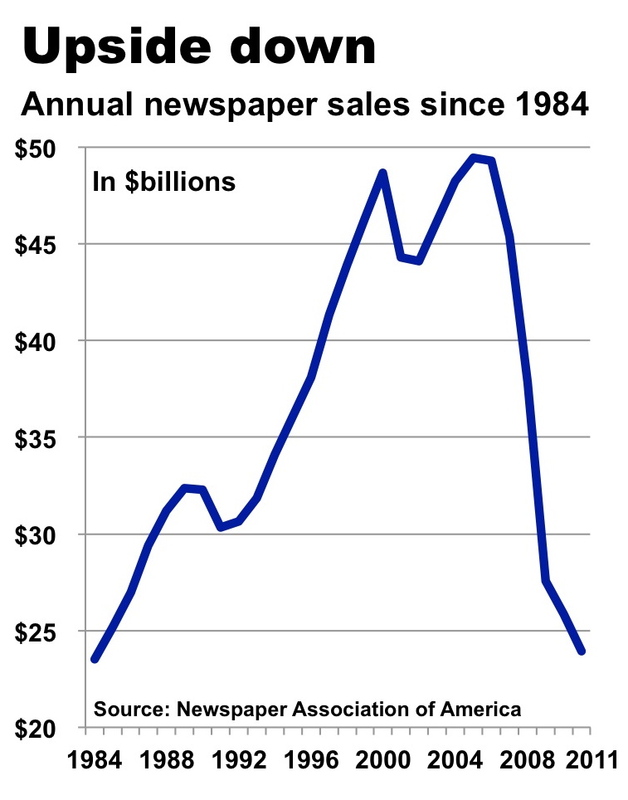 Unless newspapers angle their way back into the mix, it is hard to see how they can stop the slide in advertising that brought industry revenues to some $24 billion in 2011 from $49.4 billion in 2005. The total revenue production for newspapers last year, by the way, amounted to less than two-thirds of Google’s $37.9 billion in sales. The revenue associated with selling advertising at commerce sites is a succulent attraction for a growing number of merchants, as demonstrated by Target.Com, one of the pioneers of the trend. Whether you are shopping for watches, gardening shears or socks, you will see a slug of Google-provided ads on almost every interior page at Target.Com. The ads, amazingly, tout not only the wares of competing online merchants but also those of such bricks-and-mortar rivals as Pottery Barn and Sears. While most of the ads at the Target site are related to the merchandise on the page, the page views clearly are for sale to the highest bidder. Ads for tax-prep services, for example, were popping up all over the site as the April 15 deadline closed in. Industry sources report that a site like Target.Com is capable of generating many tens of millions of dollars in ad revenue in a year. Eyeing this potential new revenue stream, competing online retailers are hiring ad experts to monetize the white space around the merchandise. Retail analysts say it is only a matter of time until this strategy is widespread, if not commonplace. Sites like Walmart.Com and Safeway.Com not only are selling ads but also investing in editorial content to encourage shoppers to buy more stuff – and to motivate them to return. Walmart helpfully provides advice for all the major life cycles: How to plan a Barbie-themed birthday party, how to get along with your college roommate and how nutritional supplements can ease the creak in aging knees. Walmart recently appointed the former head of CBS Interactive to helm its digital commerce operations, suggesting that an even greater emphasis on content may be right around the corner. Safeway publishes an extensive collection of recipes that you can sort by the ethnicity of the cuisine, the time to cook it, the size of the group you want to serve and the difficulty of preparation. The site encourages users to review and comment on each recipe, the better to build community and repeat traffic. There’s not much advertising adjacent to the content – yet – but it's not hard to see how that could change. Like lots of other merchants, Meijer.Com, a Midwest retail chain, posts all of its newspaper ad inserts on its website, comprehensively indexing items by brand and category. In addition to carrying the usual bargains and coupons, however, the vitamin insert published in December contained full-page articles on the health benefits of fish oil and the usefulness of melatonin as a sleep aid. Venturing well beyond selling refrigerators and televisions, BestBuy.Com has created a members-only online mall it calls the Rewards Zone, which features products from more than 400 brands ranging from Saks Fifth Avenue to iTunes to Budget Rent a Car. Members receive frequent-buyer points for anything they buy at the portal, but the points can only be redeemed at – you guessed it – BestBuy. The program has three major benefits for the retailer: First, it generates some extra cash through commissions paid by the affiliate merchants. Second, it builds customer loyalty for Best Buy. But the best part is that it will provide the company with comprehensive information about the buying habits of each and every registered user. In other words, BestBuy is pursuing the Holy Grail of digital marketing: Detailed and actionable information about individuals, including who they are, where they are, what they have bought in the past and what they might buy next. 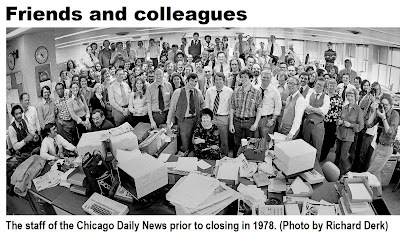 The chief way newspapers can remain relevant to marketers in the future is by developing the same kind of information for as many individuals as possible in the communities they serve. To do this successfully, this means tracking customers not only on newspaper-owned media but also across the widest possible number of digital venues in the market. Publishers who invest in this strategy will have a path forward, as advertisers increasingly de-emphasize the classic print and broadcast media in favor of efficiently targeted digital marketing. Advertisers clearly have begun moving on. Publishers need to catch up. 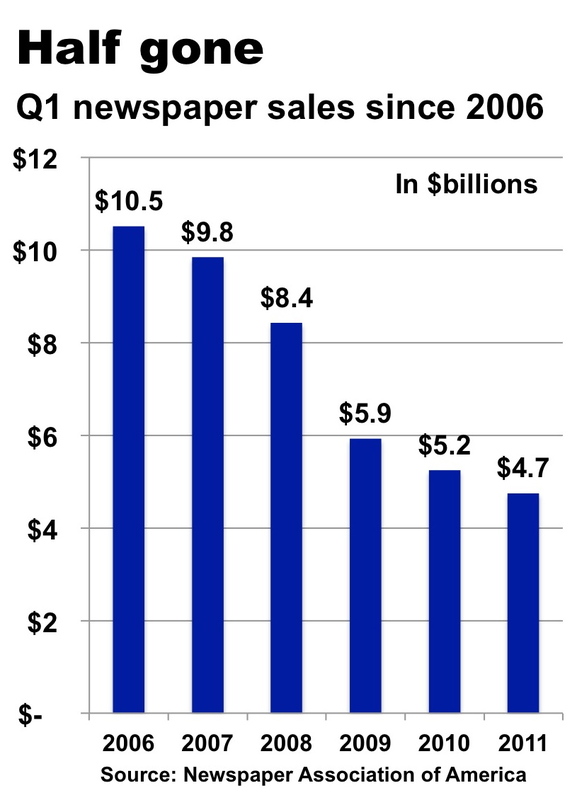 After suffering through six straight years of steadily plunging advertising revenues, some newspaper publishers say they are on track to achieve year-to-year sales gains in the first quarter of 2012. 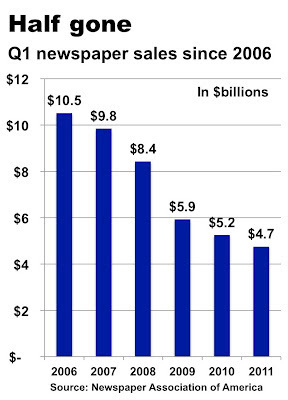 The last time newspaper ad sales grew in the first quarter was 2006, when combined industry revenues rose 0.35% from the prior year to $11.1 billion. In 2011, print and digital ad sales in the first three months were a bit under $5.6 billion, or fully 50% less than they were five years earlier. 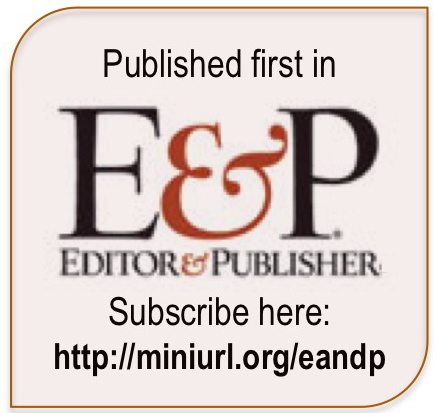 With a month to go in this quarter, a number of publishers anecdotally reported last week at a convention in San Antonio that improved retail and employment advertising had put their sales ahead of those in 2011. The uptick was not universal, and, of course, could be derailed by any number of local, national or international events. However, there was a notable sense of relief, if not to say cautious optimism, among several of the newspaper executives attending the combined confab of the Inland Press Association, the Local Media Association and the Southern Newspaper Publishers Association. In a series of informal conversations, some publishers counted it as a victory that their numbers in the first two months of 2012 were equal to those of the prior year. Others reported that their sales met or surpassed conservative budgets that forecast single-digit declines between this year and last. While a turn in the economy is bound to be helpful, it must be noted that every other medium has long since rebounded from the Great Recession, which technically ended by mid-2010 (though it is of little consolation to those continuing to suffer from foreclosure, unemployment and financially challenged retirement). In the first quarter of 2011 – that’s right, a full year ago – Internet ad sales soared 14.6%, television ad sales advanced 5.3%, magazine ad sales rose 4.5% and radio ad sales gained 1.3%, according to Kantar Media. 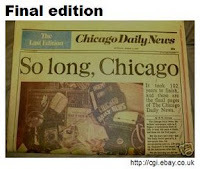 In the same period, newspaper sales fell 7.2%, according to the Newspaper Association of America. While publishers have been perfecting the fine art of doing more with less (or sometimes less with less), vigorous competitors like Groupon and Yelp have been filling their coffers at the IPO window to pursue ever more local ad dollars. And that’s not to mention such big kahunas as Google and Facebook, the latter of which will add tens of billions to its marketing war chest when it goes public in the very near future. You can't begrudge beleaguered publishers for wanting to pop a cork if they happen to have a positive first quarter. In light of the gathering competitive assault, however, they would be wise to choose inexpensive vintages and put the balance of their extra profits into beefing up their digital offerings.